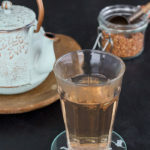 I have been a longtime fan of mugicha, a Japanese herbal tea made from roasted barley, but it has a very distinct taste that some people aren’t a fan of. I think it’s a bit like cilantro…some people love it and to some people it tastes like soap (or in the case of mugicha…dirty socks or cigarette butts are the descriptions I have heard used). A few years ago my friend Noriko introduced me to soba cha, another Japanese herbal tea, but this one is made from roasted buckwheat groats. Unlike mugicha, I have yet to meet anyone who doesn’t love it. 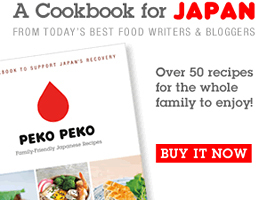 It has a nutty flavor that goes equally well with sweet and savory. 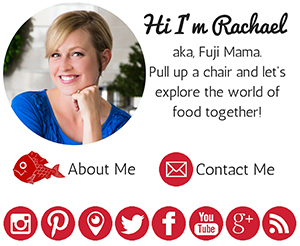 I recently decided that I should try my hand at making my own soba cha, since raw buckwheat groats are so cheap if I buy them from the bulk bins at my local grocery store and health food store. There are two ways of preparing the groats: you can roast them in the oven or you can toast them in a skillet on the stove-top. My record with roasting small items in the oven is less than stellar…let’s just say that things seem to go from not toasted to burnt if I dare blink my eyes. So I prefer to toast things in a skillet if I can. Then I can quickly adjust the heat as necessary and have a constant clear view of whatever it is I am toasting. 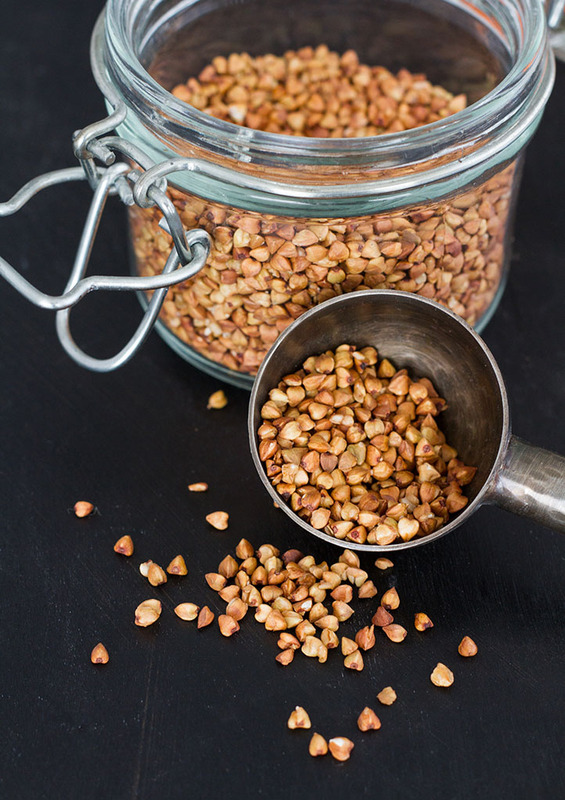 Toasting buckwheat groats couldn’t be easier. 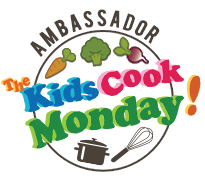 You do it in a dry skillet on the stove, stirring them around constantly so that they get evenly toasted and don’t start to burn. Once they are a dark, rich brown, they are done! I like to do about 1/2 cup at time, since this is the amount that will sit comfortably in an even layer in my favorite ceramic skillet. Once the groats are roasted and have cooled, I transfer them to an airtight container which I store in the refrigerator and measure out what I need when I want to brew a cup of soba cha. Your toasted groats should be at least this dark…I’ve gotten a bit braver and gone darker with subsequent batches, which ends up giving you an even more flavorful tea. I’m always just nervous that I’m going to cross that line between toasted and burnt! To brew the tea, I pour boiling water into a mug with the toasted buckwheat groats in a tea infuser and let it steep for 5 minutes. 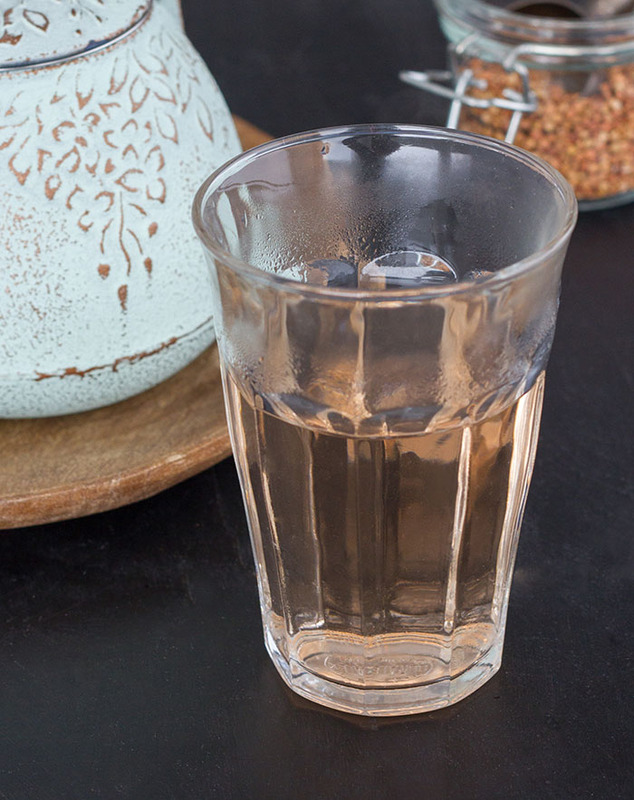 I use 1 tablespoon of toasted buckwheat groats for every 8 ounces of water. Then it’s ready to drink! I like saving the groats after I have made the soba cha and putting them in my oatmeal for breakfast the next morning. They add more flavor and then I’m not wasting anything! 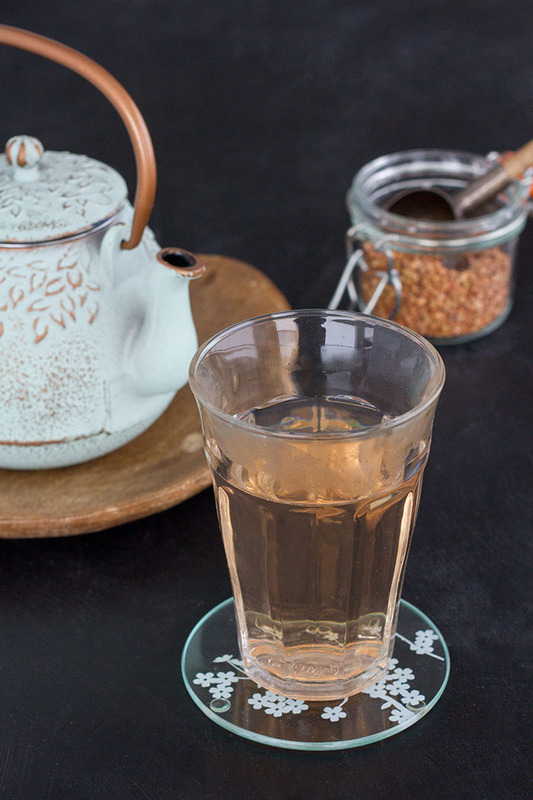 Soba cha is a Japanese tea made from roasted buckwheat groats. It has a wonderful nutty flavor! Once you have brewed your tea you can save the groats that you used and add them to your morning oatmeal for a bit of extra flavor. 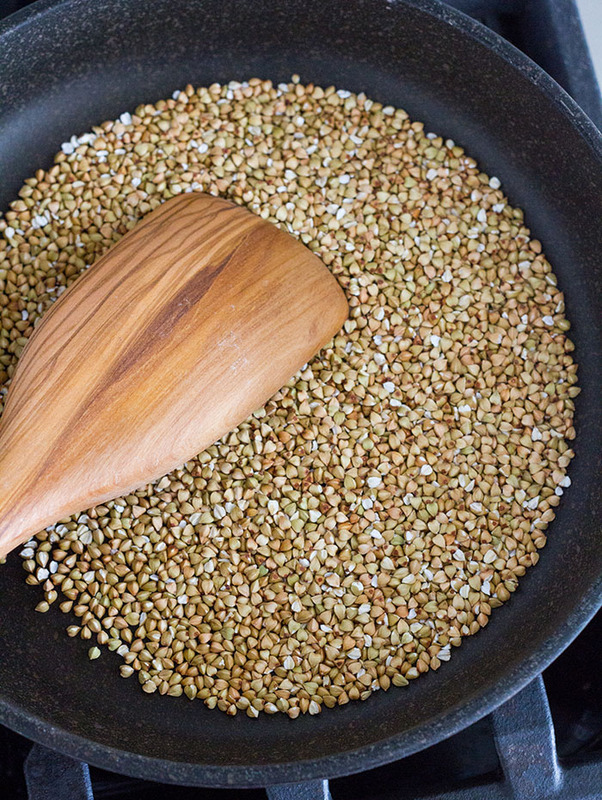 Put the raw buckwheat groats in a large skillet or pan (the groats should be able to fit in a single layer in the bottom of the skillet) over medium heat. Stir the buckwheat groats constantly, moving them around the pan, and toast them until they are fragrant and lightly browned, about 5 minutes. Reduce the heat to medium-low and continue toasting the groats until they are a deep chestnut brown. If they are starting to brown too quickly, reduce the heat further, you don't want them to burn! 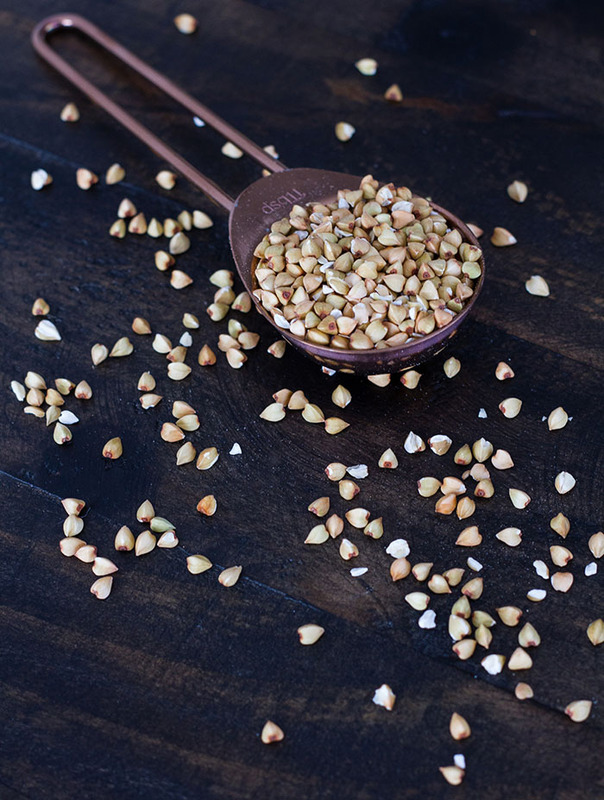 When they are the correct color, remove the skillet or pan from the heat and pour the toasted buckwheat groats into a bowl to cool and prevent them from continuing to cook in the hot skillet. Once the groats have cooled completely, put them in an airtight container and store them in the refrigerator until you are ready to steep some tea! They will keep in the refrigerator for about 3 months. 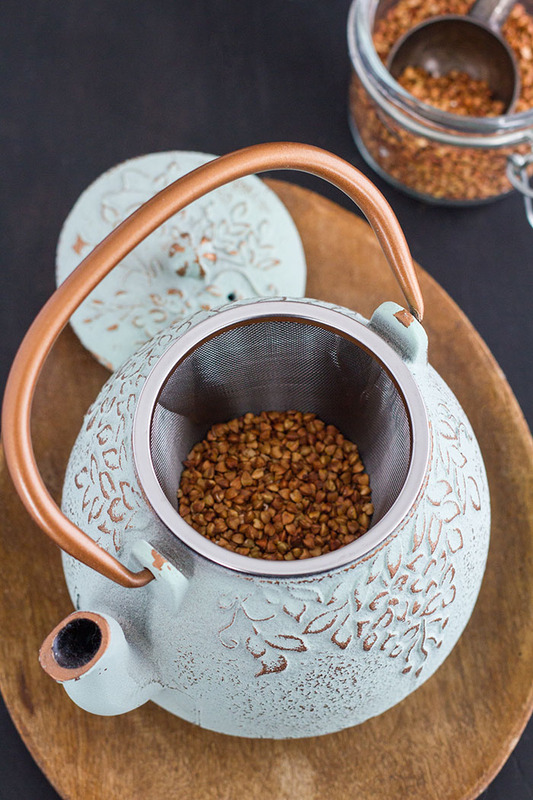 Put 1 tablespoon of toasted buckwheat groats in a tea infuser and put the tea infuser inside your mug. Pour 1 cup (8 fluid ounces) of boiling water into the cup and let the tea steep for 5 minutes. Remove the infuser and set aside. Your tea is ready to drink!